In 2008 Alberta’s Tomorrow Project (ATP) joined four other regional cohorts in a national collaboration known as the Canadian Partnership for Tomorrow Project (CPTP), with a collective enrollment of more than 300,000 participants. 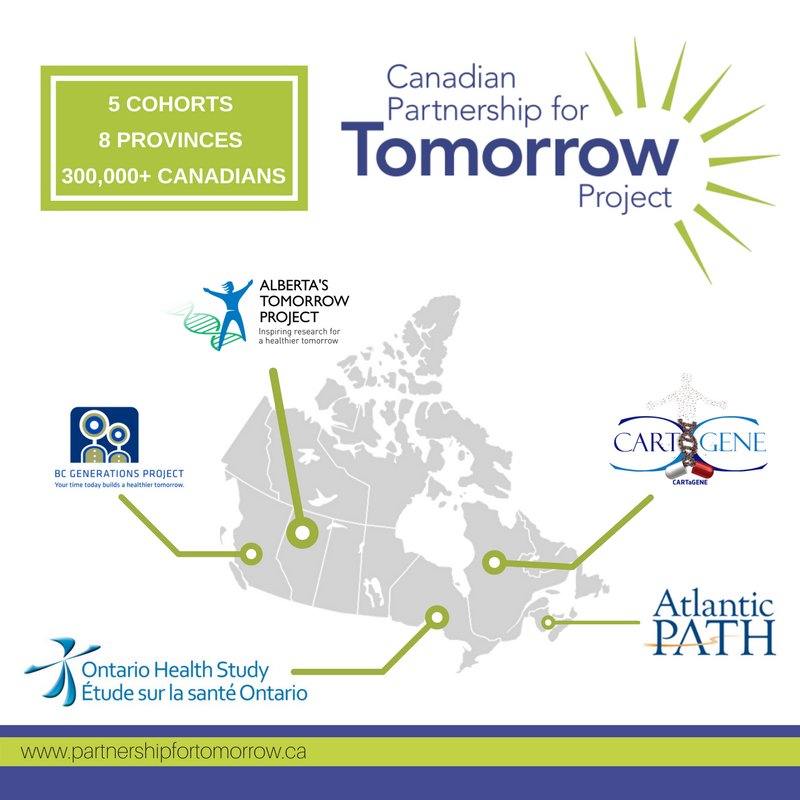 CPTP represents the largest data collection of its kind in Canada, involving the BC Generations Project, Ontario Health Study, Quebec’s CARTaGENE, Atlantic PATH, and Alberta’s Tomorrow Project. In 2018 Manitoba began recruitment, joining the consortium with The Manitoba Tomorrow Project. All participants in CPTP have completed health and lifestyle questionnaires, and many have donated biospecimens including blood samples, urine samples, physical measurements, and toenail clippings which are used to study exposure to environmental toxins. Together, CPTP partners have created a landmark research platform which will strengthen population science in Canada, producing high-quality evidence to inform health care improvements. CPTP also enables deep exploration into regional differences in cancer and chronic disease rates and risk factors across the country. Internationally, through organizations like Public Population Project in Genomics and Society (P3G) which are helping diverse research initiatives harmonize their extensive data sets, ATP and others will provide a wealth of information for comparison and analysis. More information is available on our History, Funders, and Resources pages. The Canadian Partnership for Tomorrow Project represents more than 300,000 participants from 9 Canadian provinces, to be followed for the next 20 to 30 years.